1host.my provides a reliable and robust web hosting service. With our world-class data center in Cyberjaya, Malaysia and professional technical team, you website will be up and running smooth 24x7. No more website down times and headaches. Our servers are equipped with latest tools to let you manage your site with minimal technical knowledge. Domain name is your indentity in the Web. Choosing a good domain name will benefit your business greatly. 1host.my provides low-priced domain names registration, with FREE domain tools such as WHOIS Protection, DNS Service, Domain Theft Protection. Each domain name is unique. Wait no more! Register your domain name now before it is taken! 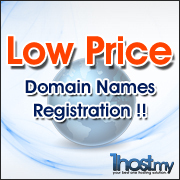 Click here to register a domain now! A fast responsive and experienced support team is all you need for a web hosting. 1host.my servers are monitored by a professional team. With years of experiences in web hosting industry, you can focus in your business and have a peace of mind with us. To contact our support team, simply submit a support ticket from the Client Area interface.